So you’ve decided to add a puppy to your family? Great decision, but what on earth do you need to make sure you have before that furry bundle of happiness and love comes into your life? That’s what we’re hoping to tell you! The most important thing you will need to have in order to make your puppy’s life perfect is love for that puppy. There are, however, a few bits and pieces that will make his physical well being just as nourished as his emotional well being. Make sure your new pup has a collar to wear all the time (that is separate from a collar he walks on). Most puppies will try to get it off in the first few days, but once he’s used to wearing it its very likely he will feel a bit naked without it on! Highly important this one, it’s law for all dogs to be microchipped now, but we also suggest getting some physical ID tags. Have your name, a contact telephone number and your house number and post code on there. If your puppy has any medical conditions, we suggest fitting an extra tag that has your vet’s details on it. Keep these tags on his collar he wears every day, but do not attach your walking lead to this collar. Some dogs walk really well on harnesses, some dogs prefer choke collars, some prefer the halti-style over the head lead. Whichever you chose for your dog, make sure they keep their ID collar on. There are a huge range of leads available from chains, rope, extendable and elastic options. 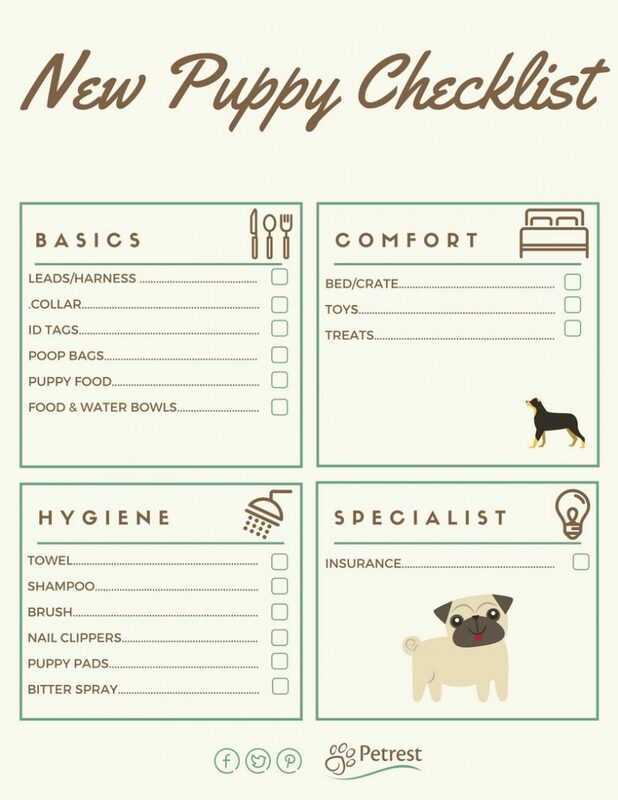 Chose which is right for you but be prepared to change if your pup isn’t getting on well with them. This is really important for exercising your puppy in the evening. Once the puppy is old enough to go outside (and has had his vaccinations) you’ll want to start walking him to burn off some of that excess energy! A light for his lead/harness will make him more visible in the dark. 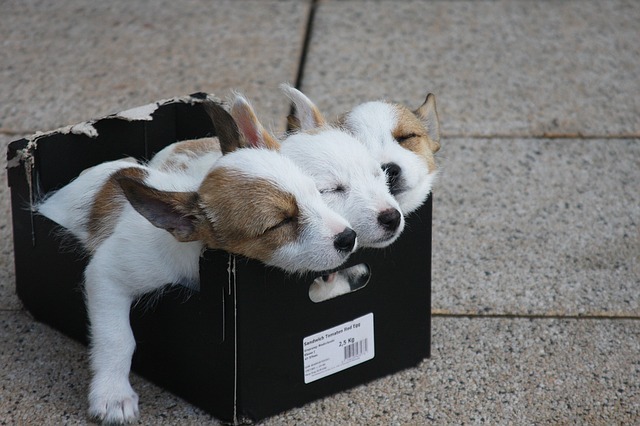 There is some controversy around crate training, but if you do decide to crate train, make sure the crate is big enough to accommodate the size that your dog will grow to, rather than just his puppy size. The same goes for beds! Some prefer a soft sided bed, while others prefer a basket style. As an added bonus, we suggest putting an old pillow or blanket, maybe an old jumper or sleeping bag you no longer need in his basket. This means his bed will smell of you straight away and he will immediately link your scent with a sense of calm and safety. Dogs really don’t mind what sort of bowl they have, be it metal, plastic or even recycled bamboo! Just be wary to pick the correct size! It’s all too easy to buy a large bowl and fill it with food, totally forgetting you have a Chihuahua! Ask the breeder or your vet about specific puppy food. 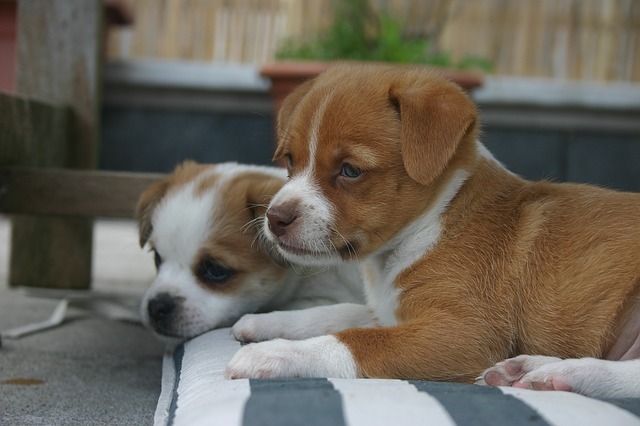 They will need to transition to normal dog food slowly, and be given puppy food to support normal growth. Think of this as follow on baby food! Toys!! We have mentioned toys because it’s important! Try your puppy with lots of different textured toys (plastic, wooden, soft, hard, rubber, etc) to see which they prefer. Some dogs will love all toys, but some may decide they only like soft cuddly noisy toys (yes, spoken from experience in the Petrest Office!). Once again, best to check with your breeder and/or vet about which treats are suitable for puppies’ sensitive tums. A word of warning, you should not be relying entirely on food treats to train your puppy. Positive rewarding with fusses and correct voice pitch will be better in the long run. Food treats work great to teach new tricks and as a way to begin training, but these do need to come out of your puppy’s daily food allowance. House training is always going to be an issue with a new puppy. 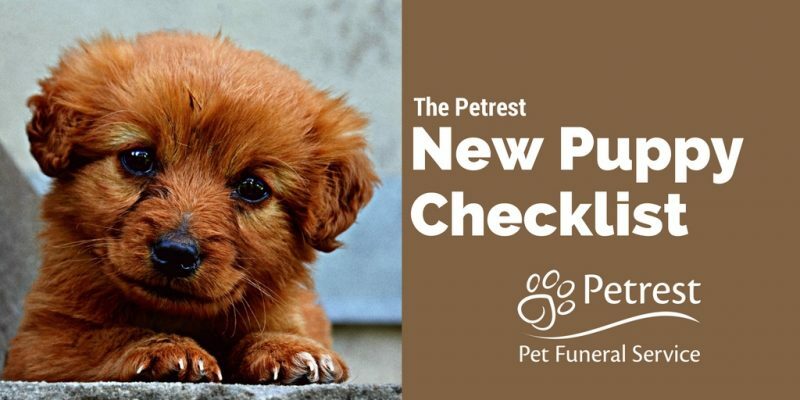 If you’ve been lucky enough to adopt an older dog [link], then this may not be an issue you will have to worry about, but a brand new 12 week old puppy? You’ll need some puppy pads! These work like a floor nappy, your pup can be trained to do his business on the puppy pads, you can then move them closer and closer to the back door (or outside area) to train him to only go when he’s outside. A not-so-glamorous part of pet companionship is cleaning up poop! With a puppy, this could be quite regularly! We suggest getting a little poop bag holder and keeping it attached to his lead for walkies! There are many forms of bitter spray (please CHECK the label, are they puppy safe?) and some people have found them effective for helping your pup learn what he is and isn’t supposed to be chewing. Some short-haired breeds (such as the Manchester Terrier) will not need regular brushing at all, but other long haired breeds will need regular grooming. For the most part, this can be done at home with breeds such as the Labrador, German Shepherd, etc. Other breeds may actually require professional grooming on a semi-regular basis. Breeds such as the Newfoundland are notorious for this because they have a thick double coat. Puppies, for the most part, love mud, and dirt, and other horrible things! Rolling in fox poo may sound pretty disgusting to us, but it smells like doggy cologne to them! Trust us, you’ll need some doggy shampoo! When your pup has had a bath (or been running around in muddy puddles) a towel will come in really handy! Your vet can advise whether you should consider clipping your pup’s nails yourself or ask them to do it. Dogs with black claws should be taken to the vet to be clipped, but those with white or see through claws might be ok to be clipped at home. INSURANCE – This is highly important!! It really is the mark of a responsible pet companion to have good insurance. It can be expensive to visit the vet. Surgery for injuries for freak accidents can cost upwards of £2000. As a guardian of that little soul who looks to you to look after them, you have to consider what is morally right for that pet at that moment in time. Is it morally right to put the pet to sleep? It might be, but it might also be morally right to give him the option of hope and try to fix him. Having good pet insurance will (hopefully) make that decision a lot easier from a financial sense. We suggest getting lifetime cover for your pet, as yearly plans can be a double edge sword. Lifetime insurance is definitely more expensive, but they will cover your pet for whatever happens during their lifetime. If your pet needs to visit the vet for whatever reasons, it’s sadly quite common for yearly plans not to cover that pet for the same problem next time. Shop around on comparison sites to get a good deal, but don’t skimp on cover. Cover may range from anything from £3 a month right up to £60+ a month depending on breed, age, and whether they are a pedigree, mongrel, or designer cross. Usually cover will average around £10-£15 a month. We hope you’ve got lots of information about adding a new puppy to your life. Pets give us the most amazing unconditional love, as well as the sweetest memories. 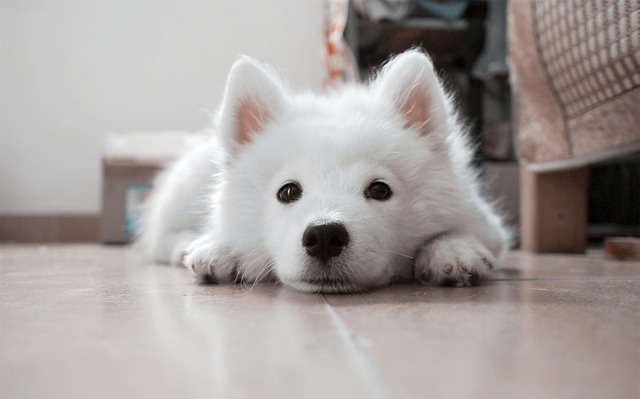 As an added side note, the Petrest team love seeing pictures of puppies!! If you’d like to share your puppy pictures, you can find us on Facebook & Twitter!